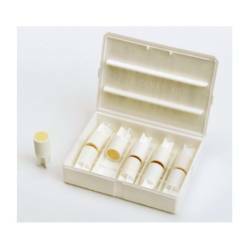 Regin S102 White Smoke Emitter Cartridges are an economical and practical method of generating a realistic swirling, non-toxic, non-staining smoke. S102 smoke cartridges produce 150 cubic feet of dense, white smoke over a 45 second burn time. The smoke is great for photographic, videographic, or theatrical special effects or remote-controlled RC aircraft and other hobbies. The small-sized emitters light with a match or can be ignited electronically. This premium product is also an excellent tool for testing, duct systems, providing a visual display of air-flow for balancing or leak detection, exhaust air systems, smoke stacks, chimneys, fume hoods, negative air pressure testing, smoke alarms, fire drills, film and photography, verification of high efficiency air filter operation, and virtually hundreds of other applications. The smoke contains no zinc or oil and leaves behind no residue. With an increasing emphasis on environmental and safety issues, this is an invaluable, practical and economic tool. Regin Smoke Cartridges are extremely stable and have a long shelf life, up to 3 years. Smoke Volume: 150 cu ft.